Writer/director Pawel Pawlikowski follows up his 2015 Oscar-winning Ida with a film that is just as immaculately crafted. Cold War, which has again earned Pawlikowski an Oscar nomination, comes in a petite package while moving expansively through history. Hitting on key moments in the lives of its two leads, the film ensnares you in its rich story, history, and characters, both beautiful and devastating. In the ruins of post-war Poland, Wiktor (Tomasz Kot) and Zula (Joanna Kulig) fall deeply, obsessively and destructively in love. As performing musicians forced to play into the communist propaganda machine, they dream of escaping to the creative freedom of the West. One day, they spot their chance to make a break for freedom in France, yet fall out with each other and make a decision that will mark their lives forever. Far and away the most impressive feat of Cold War is how it depicts its sprawling romance, which spans 20 years and 4 countries, in a tight, easily digestible 88-minutes. Squeezing such a sweeping narrative into the standard 90-minute run time is no small feat, and Pawlikowski succeeds with great success. He may keep the viewer more distanced to the romance and relationship than another filmmaker would, yet everything is so emotionally resonate because of the leads wonderful chemistry and power of Pawlikowski’s images. Shot in gorgeously indelible black & white, Pawlikowski’s compositions and Lukasz Zal’s (who also shot Ida) stunning cinematography will really give Roma a run for its money in the upcoming Oscar race. 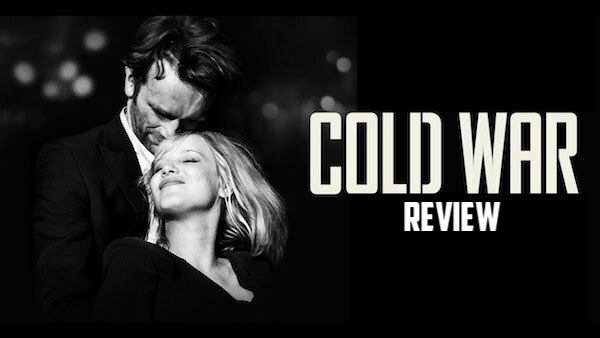 Cold War’s visual arrangements are lavish in full-bodied texture with a vibrant depth of field. At times, Pawlikowski evokes Tarkovskian imagery, particularly in the church, that enchants just as much as it provokes contemplation, constructing a haunting quality that lingers ever-present over our war-torn love birds. Compared to Ida, Pawlikowski employs far less restraint, filling much of the film with energetic camera moves that elevate the performances. Despite being in black & white, Cold War is bursting with color through the palpable chemistry of its leads. The relationship between Wiktor and Zula is not fully spelled out, and Pawlikowski sets up a lot of scenes that leave it up to the actors to make the romance tangible and certain aspects of the narrative click. Joanna Kulig is simply phenomenal in her mercurial performance — a blend of Jessica Chastain, Gena Rowlands, and Marilyn Monroe — and she should be taking Hollywood by storm. Her voice is fantastic and glides over the enjoyable soundtrack full of culturally spirited folk and hip swinging jazz. Tomasz Kot is handsome, enigmatic, and a more restrained character, with an air of Jean-Paul Belmondo, that manages to reel us in with his charisma and swagger. Using flashes of black to separate the passing years, Pawlikowski smartly manipulates the pace from slow to frenetic, allowing the audience to feel the push-and-pull aspect of Wiktor and Zula’s sporadic relationship. The use of black and white reinforces the settings iciness and reminds the viewer of the bleakness that shrouds this sweetly fatalistic romance. Its third act, in particular, is superb, and its ending is absolutely unforgettable. An inextinguishable flame wavering in a cold wind, Cold War doesn’t disappoint on its bittersweet effect. Never wasting a moment, it’s a taut historical and romantic epic that oozes with passion and life, yet another masterful work from Pawlikowski that urges to be scene on the biggest screen. Recommendation: If you love incandescent romance that is more bitter than saccharine, history, and great tunes, you will not be disappointed here. Rating: 5 metaphors outta 5. What do you think? Did Pawlikowski’s sprawling, yet breezy love story work its spell on you? We want to know. Share your thoughts and feelings in the comments section below, and as always, remember to viddy well!